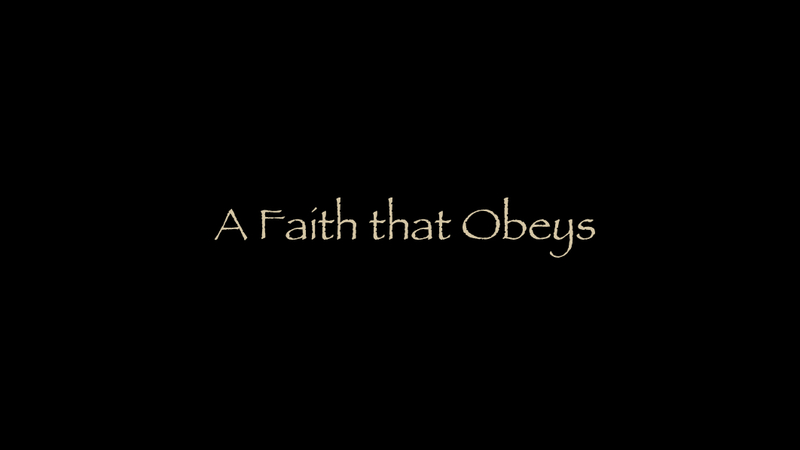 A Faith that Obeys - A Quick Review? Let's review what we have learned. Over the last few hundred years, a destructive teaching has crept into the Christian church, which ignores the biblical requirement of obedience for salvation. Salvation or the forgiveness of sins, the free gift of eternal life and the indwelling gift of God's Holy Spirit are only given to those who obey the Gospel. This is what the scriptures say clearly, consistently, and without contradiction. The evangelical church has embraced an incomplete teaching, which tells people they may experience God's blessing of salvation by simply believing in Jesus Christ. It is summed up in the unbiblical phrase, "Accept Christ as your personal Lord and Savior." When someone accepts Christ, God gives them a new spiritual "right" or "power" but this is not a salvation experience. Over the last hundred years or so, this teaching has been reinforced by the now familiar and popular method called, "The Sinner's Prayer," which has no basis in scripture. It was popularized by some really famous preachers including Billy Graham. The Graham organization still uses this prayer and it may be found on their website. The Biblical Plan of salvation, in simple terms, involves five solid steps. But remember, these steps are not rituals we do to be saved. They depict a Biblical process which occurs when God calls a person and the person is ready to respond. We should never think this is a check list for obedience, a series of hoops we jump through in order to be saved. These responses are a part of every Christian's conversion story. Without them, we have no complete conversion despite any experiences, emotions, feelings or opinions we may have to the contrary. We agree that man has no power save himself. It is the blood of Christ and His sacrifice which ultimately saves us. Jesus offers us this free gift of salvation, IF we respond in obedience to his commands. We can not make up our own way to be saved or use some other well known method, no matter how much history is behind it or how many other important and influential people have used it. Popularity does not make it right. Cherished traditions are not truth. Make no mistake, while the gift of eternal life is free, it is our responsibility to accept it by responding appropriately as outlined in the scriptures. The evangelical world tells us we receive the forgiveness of sins and the gift of eternal life when we accept Christ. The Biblical plan depicts something completely different. This is the goal we have been searching for. At what point in the conversion process are we actually saved. When does the wall of sin come down? A complete Biblical response to God's love includes the following and they, by design, have a reasonable and logical order. Let's review all of the responses to the commands we see in the Bible which always precede the forgiveness of sins. When we connect the dots, we see the plan. Step 1 - Hearing - The Gospel of salvation is something which must be heard. One person teaches it to another person. A disciple makes a disciple. Step 2 - Accept - We must accept the message, not reject it. This requires humility and sincerity. Step 3 - Repent - We must turn away from our sin and turn to God. We must do our best to get rid of all moral filth before we become a disciple. Step 4 - Confess - We must confess publicly by our words and our lives that Jesus is our Lord. When Jesus is our Lord, we walk as he did. We do not live hypocritical lives. Step 5 - Obey - We must obey the Gospel, not simply believe it. If we are unwilling to obey Jesus commands, we are not true disciples of His. We are not Christians. We must "do the will of God" to be saved. Biblical obedience includes water baptism. Even the denominational world claims water baptism as an act of obedience. Why do they insist baptism is a clear command of Christ but then argue baptism has nothing to do with the remission of sin because it is a human work? Humble obedience to Biblical commands are never human works. The evangelical world has confused works of merit with acts of obedience. The scriptures are clear, without obedience there is no forgiveness of sins. Baptism is the exact point in time and the exact place where salvation occurs. This is when and where a believer is Born Again and becomes a Christian. You can even see it happening! Once again, let's be good students of the Bible. We'll look at one last scripture to test this claim. Is water baptism a biblical requirement for salvation. Remember, we do this by asking a question, "Does the forgiveness of sins come before or after this religious experience?" Acts 2:36-38 "Therefore let all Israel be assured of this: God has made this Jesus, whom you crucified, both Lord and Christ." Wow! The entire Biblical Plan of Salvation comes together in this passage. Everything lines up. These people heard the word preached on the day of Pentecost. They humbly accepted it and wanted to change. They asked, "What shall we do?" Peter's prescription is clear and reasonable. Did you notice... repentance and baptism are connected with that little word "and." This means both must be true for the result to occur. The result of obeying Peter's commands is the forgiveness of sins and the gift of the Holy Spirit. Remember, the Holy Spirit will not dwell in a temple which has not been cleared of sin nor will the Holy Spirit be given to anyone who has not obeyed the Gospel. Baptism is HOW we obey. By the way, notice that salvation and the Holy Spirit both follow repentance and obedience? This is the Biblical Plan of salvation. God fulfills his promises at the time of our our obedience in baptism. Over the course of this series, I have tried to be extremely careful in my presentation of God's plan. But sadly, the final sticking point always seems to come down to baptism. I think it is really important for us to understand something. People are not saved just because they are baptized. There is nothing magic in the water. They are saved when they obey the Gospel by submitting to baptism. Stop thinking of baptism as a ritual. Start thinking about it as an act of humble obedience to Christ. It's easy to see, based on our studies, that obedience always precedes salvation and the Holy Spirit is never received before obedience. The debate always comes down to baptism because we fail to see or outright reject the real issue... obedience. Obedience just happens to include baptism. Well, the question comes up... "Are you saying people are not saved unless they are baptized?" What a great question. Let's talk that... briefly... next!